Gold, Platinum and Silver scrap metals, as seen through the camera of Midwest Refineries. For security reasons, we are not open for walk in traffic. All precious metals must be shipped to us. 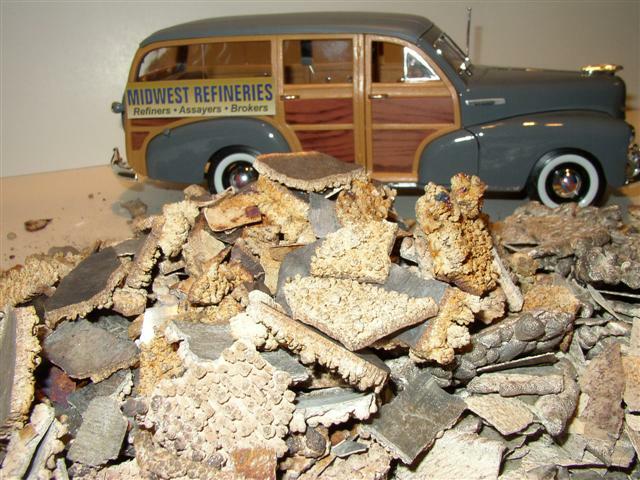 The images of precious metals in our photo gallery were taken using scale models from Midwest Refineries’ die cast metal car and truck collection. All images are the copyrighted property of Midwest Refineries, and are not to be used in any form, public or private, without our knowledge and written permission. Perhaps the most recognized gold object of the 20th century, is King Tutankhamen’s solid gold burial mask. When King Tut’s tomb was discovered in 1922 by Howard Carter, the king was wearing this 220 pound gold mask. His remains were also lying in a solid gold coffin. King Tut’s gold mask would contain about 3200 troy ounces of pure gold. It’s scrap gold value would be very small compared to it’s worth as an ancient, priceless historical treasure. If, for whatever reason, King Tutankhamen’s gold mask is ever shipped to Midwest Refineries for melt, we would immediately call the Cairo Museum , the F.B.I., or our local Police Department. We would all however, delight in admiring it in person and touching and feeling it and of course, we would take a few pictures of King Tut’s golden mask to put on our website. More than fast, speedy service, our supercharged commitment to honesty, trust and results, keeps us above the competition as precious metal refiners. 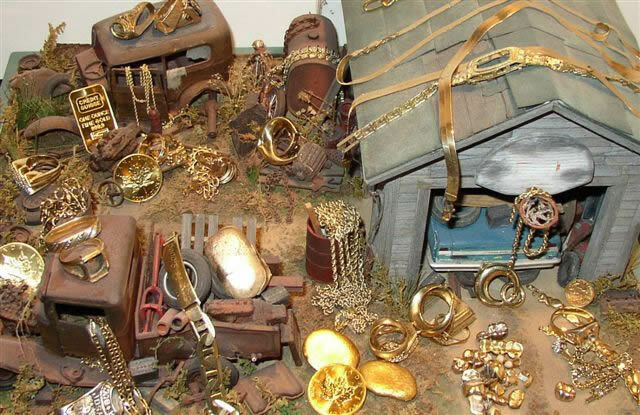 Pictured is 18 karat gold jewelry scrap, consisting of 18K rings, pocket watch cases, casting gold, 18 KT bracelets, necklaces and gold pendants. Gold refiners on top of gold shipments since 1939. It’s amazing how much gold jewelry people have lying around in drawers, safety deposit boxes and jewelry boxes, that they never wear and should sell. The money received for selling broken or unwanted gold jewelry could be spent on something they need or want. Metal detector hobbyists find lost gold jewelry on beaches, parks and in some of the most unlikely places, including Scrap Gold Gulch. Tonight, it looks like all 14 K gold jewelry including gold rings, gold chain, 14 KT gold pocket watches, gold scrap and gold jewelry. 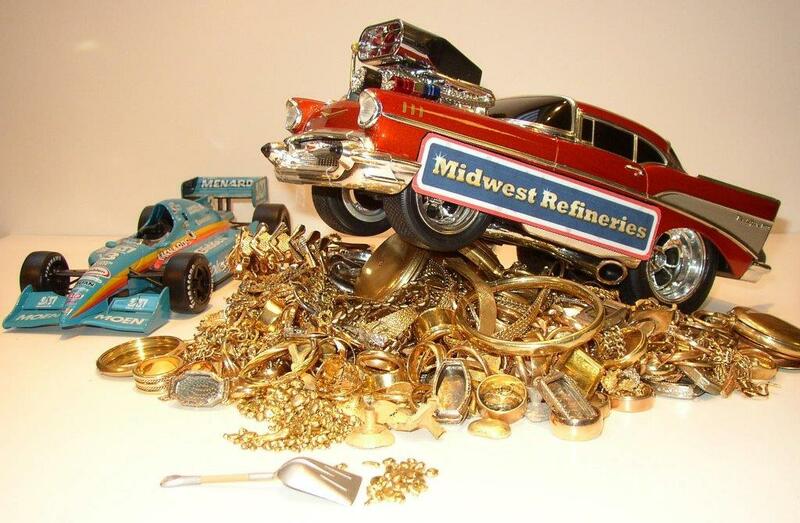 Ship your findings or unwanted gold jewelry to Midwest Refineries for prompt purchase. No amount is too small or too large. If you ever visit a Scrap Gold Gulch near you, let us know what you find. Platinum crucibles and laboratory utensils ready for melting at Midwest Refineries. Does anyone remember when you told the gas station attendant to, “filler up”? Simply a work of art! 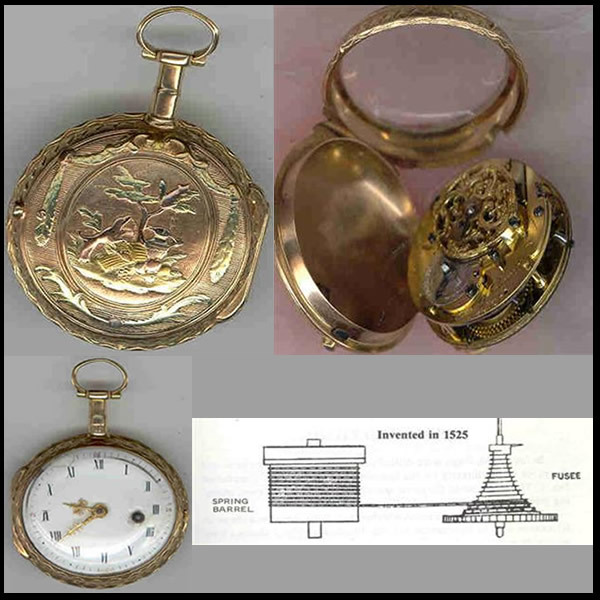 This English pocket watch from the 18th Century has a “fusee movement”. It is driven by a tiny chain with actual links, around a cone shaped devise called the fusee. The idea is, that as the winding spring runs down, the fusee has more leverage and does not slow down or loose time. Leonardo da Vinci is said to have invented the fusee. This key wound watch is protected in a tri-colored 18 karat gold case, with gold hands and balance wheel. Its porcelain dial has a few chips around the key wind hole and at the 11 o’clock position, but still keeps perfect time during the once a year, 2 hour exercise, it receives. As one views the movement and 18K case, the old expression, “they don’t make them like they used to”, is an understatement. Speaking of time, Midwest Refineries would appreciate the opportunity to be of service to you as buyers and refiners of platinum, gold and silver and anytime. Midwest Refineries is the right smelter to handle all silver flake from photographic and electrolytic recovered silver metals. Our prompt settlement times and precise assay results, are the main reasons customers choose to sell scrap silver to us. We enjoy a repeat customer loyalty unsurpassed by the majority of scrap silver refiners. Smelter, buyer and refiner of all platinum group metals, Midwest Refineries accepts all quantities of platinum wire, with no assay fees, treatment or refining charges. All platinum shipments are processed and accurately assayed so that our customers receive the highest returns possible. There is a length of a platinum banded medical catheter hidden in all this platinum-rhodium thermocouple wire. As a carpenter creates wood shavings and saw dust, jewelers, goldsmiths and jewelry repair shops create scrap consisting of gold grindings and filing dust, wipes, clippings, sweeps, findings, saw blades, sanding wheels and polishing and buffing dust. Countless goldsmiths ship their bench scraps to Midwest Refineries for accurate settlement in moneys or metals. A full-service refiner you can count on since 1939, to recycle or buy all gold, silver and platinum metals. Would you mind moving our Packard back a few yards? It’s going to get hot in here! Midwest Refineries is proud to be selected by many hospitals and medical centers to process and purchase medical grade platinum scrap. Pictured are platinum banded catheters and tips. Catheters are flexible and can be inserted into arteries in the treatment of heart disease. Many catheters contain platinum marker bands and guide wires to aid the surgeon in guiding the devise to the treatment area. Platinum is visible in x-ray images, which allow the doctor to monitor the catheters position during treatment. For those of you too young to remember, the strange humps on the rear of Cadillac cars of the ’50’s and ’60’s are called “Fins”. Mighty big Quarters, Dimes, Half Dollars and Dollars! Or, very small 1940 Chevrolet 1 ton stake truck! You be the judge. Midwest Refineries accepts all U.S. Silver coins, pre 1965, which contain 90% pure silver. Placer gold is comprised of tiny flakes and nuggets found in streams and ravines. The most common means of recovering placer gold is by panning and rinsing off sand and gravel, exposing the small flakes and nuggets. While placer gold is much prettier than cement, it is way too valuable to be used to patch a broken concrete garage floor! 250 pounds of cement costs about $12.00, while 250 pounds of placer gold will fetch enough money to buy several new garages all with attached new homes. Midwest Refineries accepts all amounts of placer gold, from a few grams to the amount in our photograph. Gold jewelry scrap, gold coins and bars and dental gold, stored with old rusted antique cars and trucks and other precious metal items. 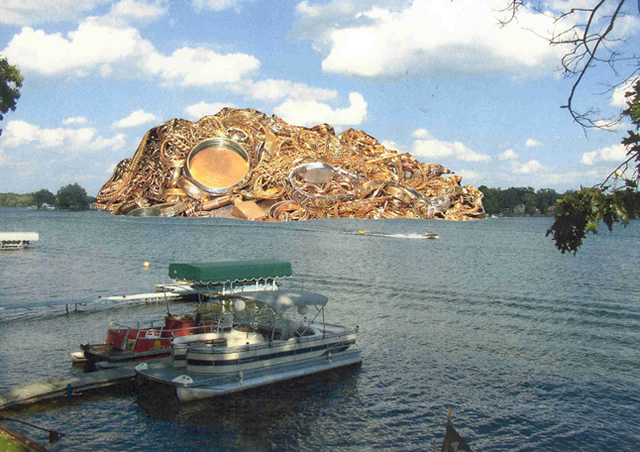 The expression, “one man’s junk is another man’s treasure”, seems fitting in this photo. 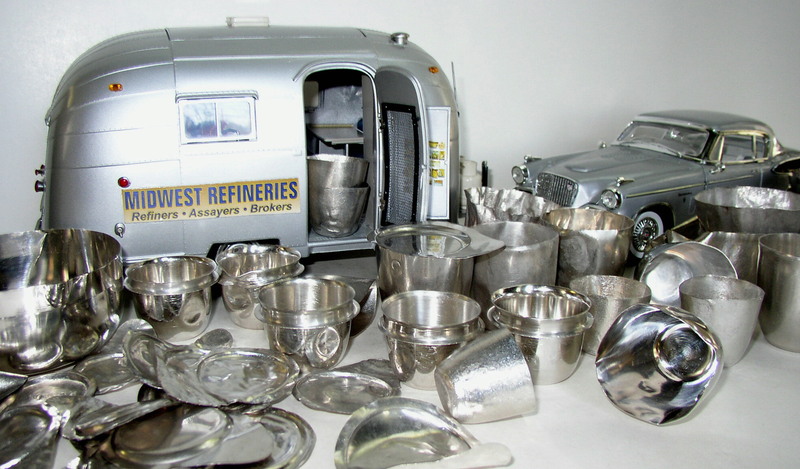 Midwest Refineries accepts all quantities of gold, silver and platinum metals. 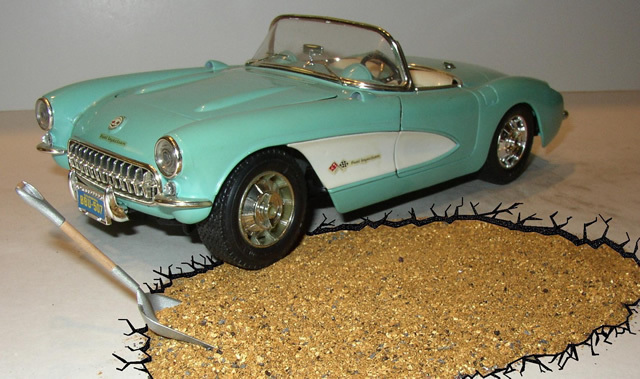 Check your garage or junk pile and ship your precious metals to us for prompt payment. Use the money to purchase something you want or need. Midwest Refineries is proud to be of service to countless metal detector hobbyists. The use of metal detectors has become quite popular and are enjoyed by thousands of people worldwide. It can be very exciting to find a gold or silver item, perhaps lost for many years. It is human nature to explore, search and look for treasures of one kind or another. There are many tales of buried treasures, sunken ships laden with gold and jewels, prospectors finding huge gold nuggets and treasure hunters searching for valuables worldwide. Whatever you may find in your quest for gold, silver and platinum, we would like to be of service to you as buyers, smelters and refiners. Midwest Refineries 1909 Ford Model T touring car is a prime example of the old expression, “all that glitters is not gold”. 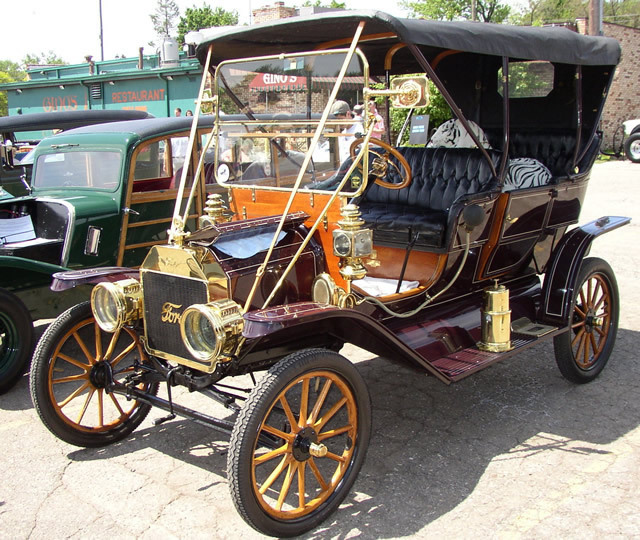 While this antique car contains no precious or noble metals, it does have a rare Aluminum body and hood and a Brass radiator, windshield, lamps, horn, running board step plates, hubcaps and door handles. The engine is cast iron and the fenders, frame, axels and hubs are vanadium steel. Even though none of these metals are precious, it remains a rare, precious, valuable, antique vehicle. When brass is polished, it looks exactly like gold and it is not magnetic. Be sure to check out your items before sending in your shipment of precious metals. Just because something looks like gold, does not mean it is. We hope you enjoyed our Precious Metal Image Gallery. Visit us again to see our latest pictures.